Honeywell Voyager 1202g Expert Reviews - Read Reviews and Buy Smarter Online. Verdict: We have always been very pleased with Honeywell barcode scanners and this one is just as reliable. Verdict: I am absolutely furious with this purchase. It does not pair via Bluetooth with our Apple Macbook Air computers yet this is not made clear anywhere in the listing and there are no product instructions included in the package. ￡200 for a bar code reader that must be plugged in That's insane. Pros: Small, lightweight, comfortable, form fitting design. Feels great in hand. 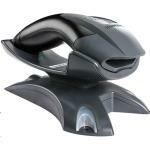 USB to base communicates and charges scanner. Green flashing indicates charging. Has a nice "find" push button on base and scanner beeps to help locate it if lost. Has a wide range of feature which I am not using. Cons: #1, doesn't support the use of the down arrow. The scanner by default scans, transmits, and then hits "enter" and it doesn't support changing this to the down arrow instead. It DOES however support using the tab key which provided as a workaround for my setup. Verdict: #2, the actual user guide doesn't come with the scanner or a disc (maybe even a link) containing the config software, only a quick start guide came with it. I had to download the user guide from their website and had to search for it as well as the "EZconfig software".